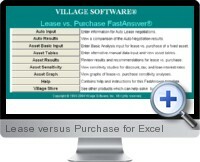 Lease vs. Purchase Analysis for Excel can help you make the best choice between leasing or purchasing an asset. It includes two comprehensive modules which cover almost every leasing evaluation scenario. The first module covers capital assets - everything from PCs to postage meters and manufacturing lines to office buildings. The second module focuses on the special case of automobile leasing and includes several decision support tools to help you negotiate your best leasing option. Lease vs. Purchase handles up to 72 financing periods, covers depreciation and maintenance options, and helps you compare costs, residual values, terms, and embedded interest rates on auto leases. The easy-to-use interface makes it simple to input and analyze your numbers. Figure out your best option for financing your automobile or acquiring your next asset - without a whole lot of pain. Let the powerful planning features of Lease vs. Purchase help you save time and money. Perform sensitivity analyzes quickly and easily to determine the lower cost decision between leasing and purchasing. Flexibility is built in. You can analyze any asset before purchasing or leasing. Reports on different types of depreciation methods, maintenance options, lease-buy-out scenarios and more over 72 periods - months or years. Over a dozen pages of content give you in-depth analyzes of your leasing vs. purchasing options. Display is suitable for both color and monochrome monitors. The Auto module allows for the evaluation of up to 5 negotiations of dealer pricing schemes or lender financing arrangements. Unique print dialog box lets you print anything in the program with just two button clicks. Support is provided by a superior author network. You get the actual product author's name, telephone number, and support hours at the click of a button. View graphs of your lease vs. purchase options by interest rate, taxes or discounts. Make the most informed capital investment decision and learn how your assumptions can influence your financing decisions.